What a beautiful day! Finally, the winter air is hovering in the 30’s, the glorious sunshine pops out between the fast moving fluffy clouds and it is just a great day for snowshoeing. Of course, I dressed too warm, which became apparent during my first quarter mile. I began peeling layers off as I walked across the deep snow and ended up carrying most of my outerwear by the time I got back to shore. Any longer of a walk and who knows? I may of ended up just in my long johns. 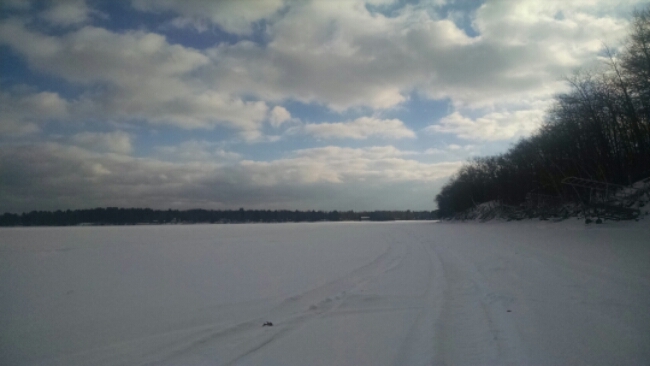 The flowage was stunning, as always, and many snowmobilers raced back and forth across Chief Lake. I walked along the shoreline and gazed up at the cabins and lake homes. What a different look from summer; despite the lake activity today, the bordering homes looked abandoned and lonely. Piers stacked up neatly and all hints of summer stored away out of sight. I didn’t get as far as I wanted, but the walk sure got my heart pumping. Walking through the snow is always harder than it appears. Besides I am just recovering from the fiasco of a hike through the woods just the other day. A great start though and I can’t wait for tomorrow’s snowshoe hike! This entry was posted in NORTHWOODS LIFE, Scenic Observations, Snowshoeing and tagged cathy lareau, snowshoeing on Chippewa flowage, winter activities Hayward wi, winter in Hayward. Bookmark the permalink.